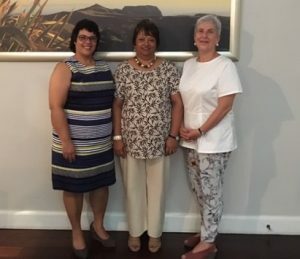 St Helena can claim further success in the Cambridge International Certificate in Educational Leadership course as Head Teacher of St Paul’s Primary School, Pat Williams, has passed with a ‘Distinction’ grade. All Cambridge Professional Development Qualifications at Certificate Award level are placed on the Higher Education Qualifications Framework (HEQF) at Level 4. This means that the academic and skill demands are equivalent to being on the first year of a university course. The Cambridge International Certificate & Diploma in Educational Leadership is a Professional Development Qualification run by the prestigious University of Cambridge in the United Kingdom. The qualification is internationally recognised as a mark of excellence for the individual Educational Leader and aims to improve professional profiles and career development.